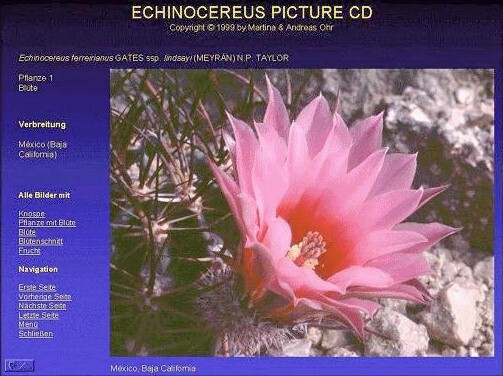 The cover description says this is 'An extensive digital picture book with over 750 slide of 89 species and sub-species of the genus Echinocereus'. This is a very accurate description of what this disk contains as there is not a great deal of descriptive text. The pictures however are of an exceptionally high quality and different photographs have been included to show the plant body, flower buds, open flowers, sectioned flowers and seedpods in many cases, so this is many ways better than a detailed verbal description. The specimens shown have details of their origin mostly with the use of collection numbers, which makes this CD a serious reference tool for the keen grower and student of the genus. The illustration shows the layout of a typical page. The disk does not contain an exhaustive collection of Echinocereus species but it is planned to expand the coverage in future editions and provide updates. The content is very well organised and easy to navigate around using Microsoft's PowerPoint viewer software (included on the disk). The only slight disadvantage of this is that the CD is therefore only usable on Windows 95/98 or NT operating systems which will come as a disappointment to those of you using older PCs or Macs. This also results in the requirement for 16Mb of memory (32Mb recommended) for Windows 95/98 and 32Mb (64Mb recommended) for Windows NT users. You also need a monitor resolution of 800 x 600 pixels or higher and at least 16 bit colors (32 bit recommended). If you can meet these requirements and Echinocereus are amongst your favorites then this CD will give you a great deal of pleasure and use and is highly recommended. The CD-ROM is available from Martina and Andreas Ohr who run an excellent monthly e-zine on the genus and full ordering details can be found on their website.